How would you describe yourself and your blog in one sentence? I’m 21-year-old beauty, fashion and interior obsessed student (and blogger) and I hope that my blog reflects that. I started my blog in September 2017 - it feels like yesterday that I was nervously writing my first post. What made you decide to want to start blogging? I’ve always been a creative person and I felt like something was missing for such a long time. I realised how badly I needed an outlet for all of the ideas I was having and suddenly I decided to create a blog. I wanted a space where I could be myself and talk about the things I love. What is your favourite thing about being a blogger/content creator? I love knowing that some people read my content to feel better. I’ve always turned to bloggers as a source of comfort so it’s lovely knowing that I can be that person for others. I wish I knew how organised that I had to be! Back when I started my blog I had no idea how much planning was involved in running my own website. It was during Blogmas that I thought “WOAH, I should’ve planned this weeks ago” so ever since then I’ve been planning my content months in advance to avoid last minute panics! What is your biggest dream when it comes to blogging? What would you like to achieve? I’d love to be able to do blogging full time. At the moment, I’m balancing it with my final year at university but I can’t wait to be able to do it all the time and to be able to throw everything I have at it! What’s one must have item for you when it comes to blogging? What is your favourite blog post that you have published? Why? Without it sounding like a sob story, I wrote a post about why I find December so tough. It was the first time that I had opened up about my personal life on my blog and the response was so overwhelming. It actually sparked my decision to share my blog posts on social media. Prior to that, I had been hiding my blog from everyone! I’m so proud of it and I’m also very happy that it helped so many people. That’s why it’s my favourite post. 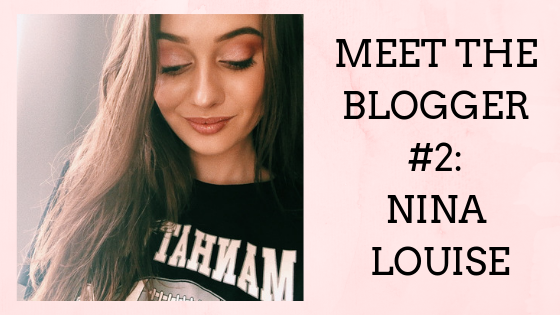 Thank you to Nina for taking part in my Meet The Blogger series! If you want to get involved, please remember to get in touch!